When dealing with real examples, it's often difficult to determine what needs to be done in order to satisfy the parameters of the call. One of the previous links posted in this thread talks about the various registers that get pushed on to the stack - but that relates to the prologue, of which is a non-critical component when calling a function from a separate thread. That said, is there a method that can be followed for determining these requirements? I would assume that every situation is going to be different, but are there any tips or tricks that can be used to reduce my current method of trial-and-error guessing? Okay, so, in one of my previous examples, eax was pushed on to the stack, then a value was copied to the ecx register just before the call. However, after the call, only ecx was popped off the stack. In an example like this, that would mean only 1 argument needed to be satisfied, yet, the eax push was required before the call. Based on your reply, it seems like a good way to identify the calling procedure, but how does it help me with determining how to satisfy the arguments of the call? It seems confusing. So if we can instead pop ecx which takes just 1 byte, why not? Compiler knows that ecx will be invalid after function call, then why not make stack cleanup (with 1 dword) much more effectively? Pop ecx will reduce the size of stack cleanup from 3 to 1 instruction and ecx is invalid anyways. Thanks a lot, Pancake. Although I feel more confused after reading that, I am understanding a little bit more, even if only a little at a time. I appreciate you for writing that up and explaining it to me. I will continue to try to wrap my head around this. I have tried several different things, to no avail. 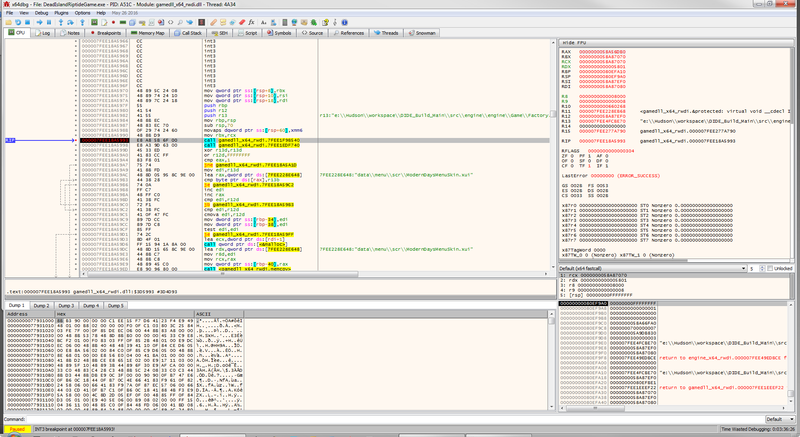 According to the x64 calling conventions, arguments are passed in registers RCX, RDX, R8 & R9. Based on the above, I tried pushing RCX before the call, as well as using sub rsp,70, but that didn't work. Can anyone point me in the right direction? I assume that I need to set a breakpoint on the call that I'm interested in and look at the register values. But how do I know which arguments to pass? Do I just pass them all? What about the call stack...should I be looking at that? I feel like I'm close to figuring this out, but I just can't seem to put the missing pieces together. It's impossible to give relevant answer to your question without seeing how the function at address 7FEE08EB540 looks like. So you need to see inside the call in order to call it? I wasn't aware of that. Is that the case if I am calling from a separate thread as well? I was thinking that the prologue/epilogue of the call is handled by the call itself, so I just assumed that it was only necessary to give importance to the data for the sub-routine where the call resides. I hope you can have patience with my newbieness. Unfortunately, I have since deleted this game from my computer, but I will reinstall it and provide whatever info you need, because I'd really like to figure this out...even if it's for a different target, it really doesn't matter to me. So you need to see inside the call in order to call it? I wasn't aware of that. I need to see inside the call in order to learn how to call it. Just like you need to open an unmarked box to learn what's inside it. From outside you can only tell that the box is heavy, made from black plastic and has a lid - but you have no idea what's inside. Awesome...I really appreciate your help, kao. 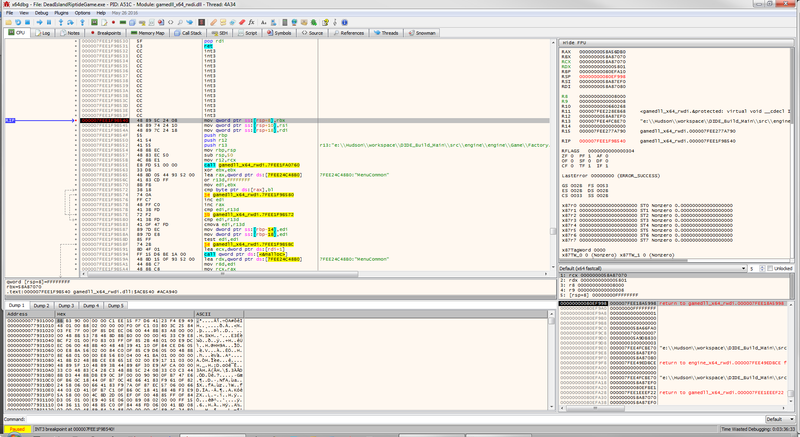 So, here is a screenshot with a breakpoint on the call, as well as a screenshot with a breakpoint inside the call. I hope this helps. Please let me know if you need anything else. Thanks, again. It looks like RCX register is used (at address 7FEE08EB55B). RDX, R8, R9 are not saved before call instruction (at address 7FEE08EB55E), so you can assume they are not used. XMM registers also seem to be not used. I can't tell you how to get the correct RCX value, that code is not present in your screenshots. Great! This is making a lot of sense. When I set a breakpoint on the call, it shows the value of RCX address on the right (58A87070). Is that not what you mean? Unfortunately, the value of RCX is not static. How do I get this information? Do I need to backtrace to see where the value is set first? Do I need to backtrace to see where the value is set first? I haven't posted back here yet because I'm still working on this. I don't know if I'll be able to figure it out or not. The bad thing is, the section of code that I'm interested in, only gets executed at startup...so it makes it all the more difficult to do what I need. I will post my findings whenever I have something more meaningful to share...or I will just fail miserably and post that. Yeah, I have just been practicing with any program that I happen to be messing with at the time. Since I don't have any programming background, it's easier for me. I wanted to try the example above because I knew that it would be challenging, so, if I can figure it out, I should be able to do most of the easier ones. http://beginners.re This book should cover the basics. I have managed to execute the call by setting ecx and jumping to the start of the sub-routine where the call resides via a separate thread. However, calling the sub-routine in lieu of jumping to it, using the exact same method, caused the target to crash. Since this was performed via a separate thread and not from within any of the utilized modules, I am confused as to why one way is successful while the other is not, seeing as they are performing the same actions (so I thought). Anyone have any ideas as to why this is so?